so what order should the spark plug leads attatch to the distributor cap??? hayes gives order from the fly wheel as 1342 but how does this then tally on dis cap??? 1342 is the order they go in terms of distance from the flywheel but I think the firing order is 1432 but I cant be sure without looking. I know the later Haynes gives all the details you need but im stuck with the early one too. If you get the engine to TDC position for the number one cylinder using the timing mark on the flywheel, and work out the direction of the distributor rotor arm when the engine moves, then you'll know which lead is for the number one plug as that will be the one in line with the connection on the dissy cap that corresponds with that lead. Then youll have to work out which metal contact the rotor arm will move over next and so on and work out which lead it goes to. Im not 100% sure this is how it all works, but I had to do this to my car when I changed the engine. Somehow I got it wrong and it fired on 2 cylinders, so I removed each HT to find one or two that didnt make any difference. I removed one to find that the engine actually sped up Swapping this and another one was the answer but I was worried about my newly installed engine for a while. The engine axles turns the same way as the wheels - so does the distributor rotor arm as this is locked to the cam axle. Thats a handy rule of thumb to remember. Given the vast number of Ducellier & Bosch cap variants over the models & years - there is no exact rule as to where the rotor arm should point. Finding the index is always by removing the spark plugs - then turn the engine by hand (engage 5.th gear and pull car forwards) while you have your thumb over the cylinder # 4 plug hole. Cylinder 4 as pr Haynes is the cylinder next to the cambelt - with the longest plug lead. Once this index is established - the rest is easy peasy. Which gives 4213 with 4 as index. AndersDK wrote: The engine axles turns the same way as the wheels - so does the distributor rotor arm as this is locked to the cam axle. In my 19TRS the leads come out of the cap pointing towards the rear of the car. Last edited by ellevie on Tue Sep 26, 2006 1:49 pm, edited 1 time in total. Really? Hope your not just pulling my let, but thats quite mad! Guess really theres nothing to stop it happeneing, does the water going through the rad the wrong way not cause problems! 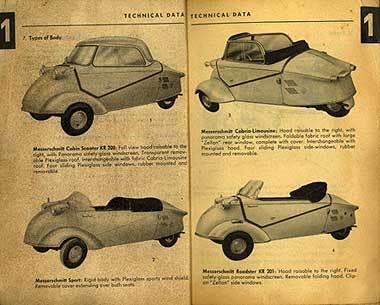 The Messersmitt cabin scooter (which is quite a collectors piece now) had a single cylinder 2 stroke engine - and motorcycle type 4 speed gearbox in one unit at the rear - suspension being by trailing arm which doubled as a chain case. Engine had 2 sets of points and a dynastart - which is a relay controlled combined dynamo and starter directly driven by the engine. Starter was almost silent as it had no drive gearing - and to go backwards you turned off the engine, pushed the key in and started it in reverse. The gearbox had a simple push/pull lever on the side - which worked a sequential box, with a trigger for finding neutral. With 2 wheels at the front there steering column had a right angle bracket about 3 inches long welded to it which engaged directly with the track rod - and the steering was nice and direct via a handlebar. The best one to have was the 500cc 'Tiger' which had 2 back wheels about 6 inches apart - either side of the chaincase. Except presumably it only works with a 2 stroke. Surely a 4 stroke would be opening the exhaust cams before the inlet cams...? Messerschmitt was a 2 stroke engine - and unless there is a complicated mechanism to turn round the valve timing it won't work with a 4 stroke engine. It was air cooled as well.